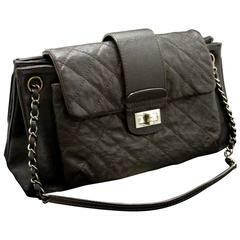 This CHANEL Mini Small Chain Shoulder Bag Crossbody Black Quilted Flap is no longer available. Condition & Ratings Outside: 8 of 10 Excellent condition with minimal signs of use. Slight scratches. Inside: 8 of 10 Excellent condition with minimal signs of use. Very clean. Strap: 7 of 10 Very nice condition with minimal signs of use. Slight scuff marks on the leather. Hardware: 8 of 10 Shiny and excellent condition with minimal signs of use. Dust bag: 7 of 10 Very nice condition with minimal signs of use. Smell Mold: NO Perfume: NO Cigarette: NO The smell is judged by us and it may differ depending on the individual. Please refrain from the purchase if you are sensitive to smell. Details Approx. size: H5.9" x W7.8" x D2.4" (H15 x W20 x D6.3 cm) Approx. strap drop: 20.4" (52 cm) Approx. strap length: 40.9" (104 cm) Outside material: Lambskin Color: Black Hardware and chain: Gold-tone Made in France Serial sticker: Attached Serial #:1285474 (Same number on the sticker and the card.) Comes with: Authenticity card, Dust bag Originally purchased in 1990. (The sticker says in Japanese calendar year "(Heisei) 2", which is the same as 1990.) The mannequin may be smaller than you. She is wearing clothes in size US 6. The clothes, mannequin, and iPhone are not included. 100 % Authentic guaranteed or money back. If there is iPhone6 in picture, it is just reference of size and does not come with item. Shipping FREE SHIPPING! The item will be shipped from Japan by EMS (Expedited Airmail) with full insurance and tracking service. You can use DHL by telling us your account number of DHL. If you want us to use DHL by using our account, please let us know that and we will estimate additional cost for you. If the item is small, we would use DHL by our judgment. The item will be wrapped carefully by bubble wrap and plastic bag, and put in a cardboard box. About Us We are a second hand dealer licensed by Japan National Public Safety Commission. The items are bought from dealer's markets where fakes are strictly prohibited. Please bid with confidence.100 % Authentic guaranteed. Import duties Import duties or charges are not included in the item price or shipping charges. These charges are the buyer's responsibility. Please ask your country’s Customs office to determine what these additional costs will be prior to bidding/buying. We do not falsify customs forms - US and International government regulations prohibit such behavior.